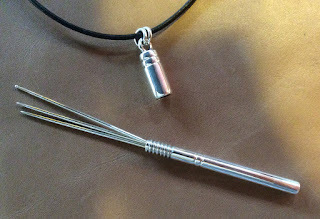 Of all the tools I make, the neck needle pendants have been the ones that bring the biggest smile to my face. First off, they are just really neat. You could say they were beautiful as well, but the best way to describe them is that they just have a high "cool factor". they are even cooler because of what they represent. Just as we would never go on an extended wilderness backpacking trip without a first aid kit, we are expressing the importance of our medicine in a "don't leave home without it" kind of way. This shows that we actually see what we are doing as medicine and expressing outwardly a desire to help those in need, not just when they have an appointment but when they need it. How fitting that this miniature first aid kit resides next to our own hearts. Because this one holds three teishins, I am calling it a "quiver." Which reminds me of the ancient Japanese art of Kyudo or archery. One philosophical idea from Kyudo is that the goal of Kyudo is not that the arrow must hit the target, but that the arrow pierces the heart of the shooter himself. I think this is a wonderful idea; to believe that our acts should penetrate our very souls. When creating work like this simple teishin case I feel like I get a glimpse of this part of my self and it gives me much joy. This case was designed for a massage therapist (I do hate to use that limiting term for this particular client because she has learned so many other techniques and devises very intricate and specific treatment plans for her patients), that uses teishins as well as a diverse array of other treatment techniques ranging from yoga to ultrasound, crystalline sound therapy, tui na, reiki and too many more to list. I was a bit confused at first because she wanted three identical teishins. It turns out she has much more co-ordination than I and uses several teishins simultaneously during her treatments. 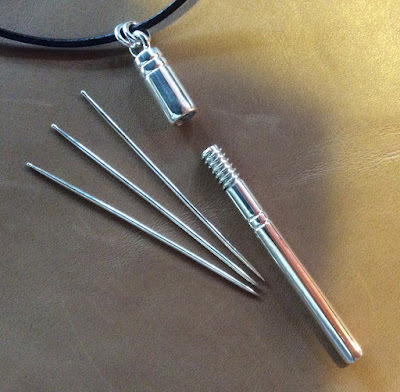 This case was made a bit differently than my other neck needle cases which are machined entirely from a solid piece of silver. This case was fabricated from multiple layers of tubing and round bar. Even the threads were fabricated from coils of wire instead of being cut with a die. This results in a very attractive and durable thread. 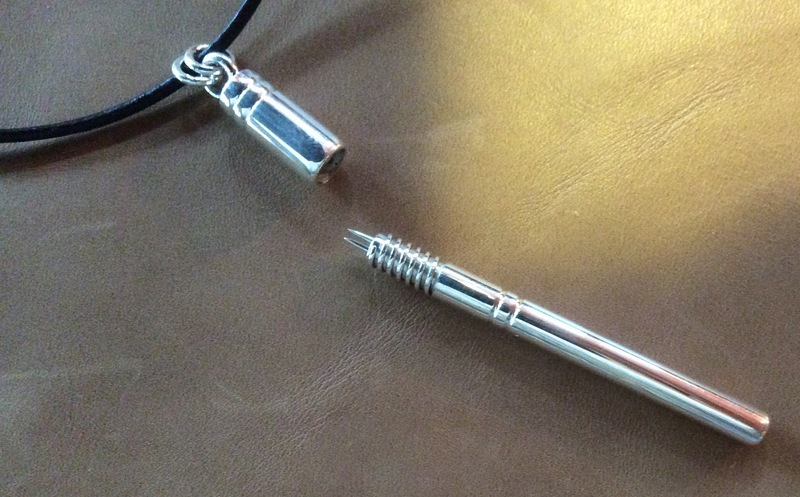 The pendant itself is around 2.5" long, and houses three 16 gage by 2.25" teishins. 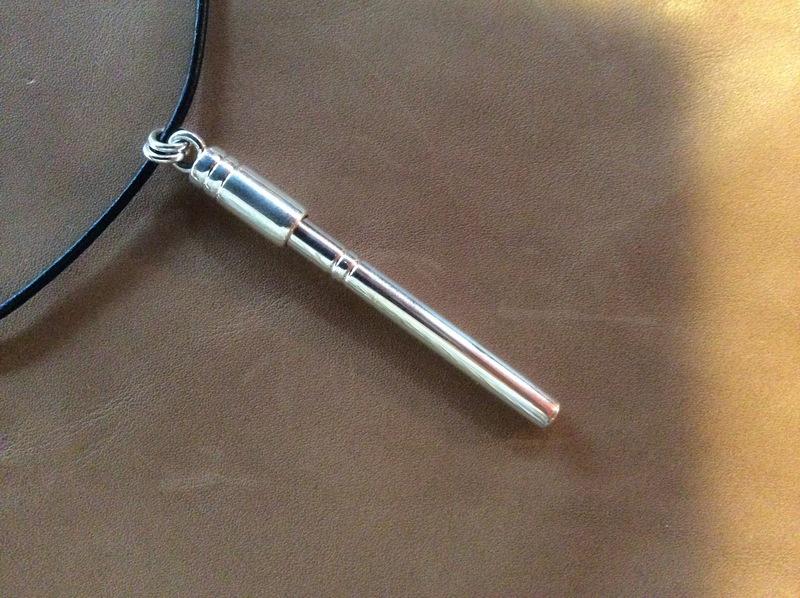 I think I will be making myself one of these, maybe with the trio of a gold, silver, and copper teishin. Now that will be cool! This is also one of the oversized Acupuncture tubes with a 4.6mm diameter and 70mm length. It has the diameter reduced throughout the center section to about 4.1mm so that only the ends that contact the patients skin and the practitioners oshide maintain the full diameter. This was modeled after some steel tubes that one of my clients particularly liked. His tubes had more of a angular/mechanical and "trumpeted" appearance, with a greater reduction in the midsection. I wanted to maintain a little more softness and roundness to this subtle accent. I also chose to call this effect barreling. This is a term used in archery to describe an arrow that has been tapered and reduced in certain sections to improve its aerodynamics, and penetration. I did not think I would like this shape, but after handling it, I have quite come to like it. 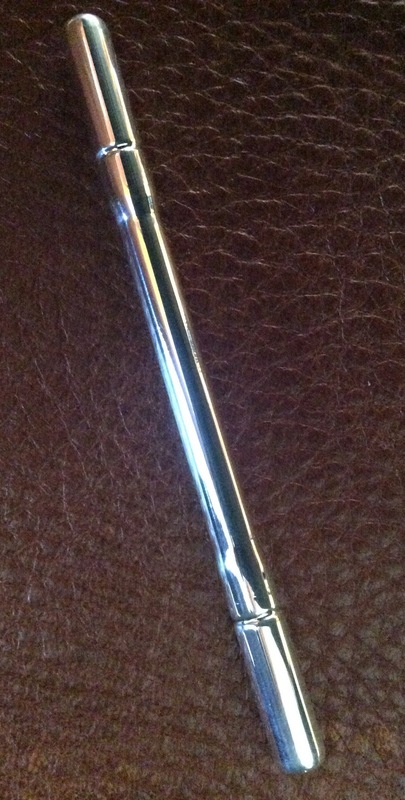 The indentation where the diameter swells fits perfectly to the thumb and middle finger when holding the tube or performing one handed reloading. The relative extra mass at the ends makes the tube want to spin in the hand during reload very smoothly. This is very fun and functional. I still have a personal preference for smaller diameter tubes as long as they have ample mass. Fortunately, this feature could be built into my normal diameter tubes as well for the best of both worlds.